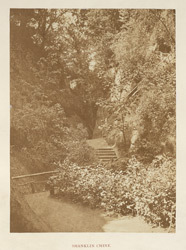 "Shanklin Chine, like all others in the island, has been formed by the action of running water. In fact, to be prosaic, they are huge gulleys, dependent for their formation upon soft earth and rain streams. At Shanklin the farther cutting away of the earth is stopped by the simple use of a stone slab on the edge of the cliff over which the rain has passed for so many centuries. The waterfall looks very pretty from below; and chatting with the half-agricultural, half-marine, friendly-faced fellow who keeps the gate, we take another mug of the slightly mineralized water, which here flows into a small stone receptacle. The water is ferruginous. The keeper declares it saves children who are suffering from rickets."